What is a Cybersecurity Solution & What Problems Can They Solve : Consolidated Technologies, Inc.
What Is a Cybersecurity Solution? Did you know that more than 850 businesses have experienced data breaches in the past year, with over 30 million records exposed? Or that 60 percent of all small businesses fail within six months after a cyber attack — seeing as 19 percent of customers would completely stop shopping at a retailer who experienced a security breach? With sobering statistics like these, how do you protect both your company and your customers from the harmful effects of security breaches? Luckily, cybersecurity solutions have emerged that allow businesses of nearly any size to take a stand against threats. Cybersecurity refers to a company’s protection against unauthorized or criminal use of electronic data, and cybersecurity services are the overarching processes put in place to achieve this security and protect against common cyber threats. Malware: Malware — or malicious software — is a program installed into a system to compromise its data’s availability, integrity or confidentiality. Malware programs are discreet but have become one of the biggest external threats facing business networks today. Ransomware: Ransomware uses malware to limit access to your own system through encryption and then asks you to pay a “ransom” online to decrypt the system and regain your access. Phishing: Cybercriminals use phishing to obtain data by pretending to be a legitimate business representative. They’ll often issue a warning related to your account and ask you for a response with a link to a fake website asking you to provide passwords or other sensitive information. Distributed denial of service (DDoS) attacks: DDoS attacks limit access to a network by overwhelming it with traffic requests to slow website response time. This is often used as a distraction while criminals commit other types of cybercrime. Encryption: Data encryption ensures that even if your data is stolen, hackers wouldn’t be able to read it. Encryption is especially important if you often transfer data from one system to another, as it might be stolen during the transfer. Data loss prevention: Data is essential in your day-to-day operation, and data loss prevention methods ensure your data is available for your access at all times. Access management: Not just anyone in your company should have access to the organization’s sensitive information. Access and identity management ensures data is accessed only on a need-to-know basis and that those obtaining the information are who they say they are. Firewalls: Firewalls control the flow of outgoing and incoming network traffic to protect against untrusted networks and potential malicious attacks. Anti-virus and anti-malware solutions: Anti-virus and anti-malware software is one of the most fundamental cybersecurity solutions in any computer network. It scans the system for threats and blocks viruses from accessing your devices. Web filtering: Web filtering stops employees from accidentally accessing harmful services on the company’s network that could expose the business to a data breach. Risk and compliance management: Businesses in many industries need cybersecurity services to meet federal regulations or industry standards. Risk and compliance management provides a dedicated solution for meeting these needs. Human error: Employee error — not malicious intent — is by far the biggest reason for data breaches. Web filtering and other cybersecurity tools lessen the risk of human error by stopping employees from accessing harmful sites and falling prey to phishing schemes. External threats: Hackers are becoming increasingly skilled in finding ways to get around traditional firewalls and steal your data. Cybersecurity services ensure your firewalls, anti-virus software and other solutions are continually up-to-date and ready to protect your infrastructure. Insider criminal activity: Unfortunately, one of the hardest realities for both small and large businesses is the stealing of data from within the organization. Security solutions safeguard your information from the inside and make sure only those who need to know can access your sensitive data. Unsecured cloud storage: As cloud servers grow in popularity, so too are cloud storage security breaches on the rise. IBM reported that misconfigured cloud servers were responsible for almost 70 percent of all compromised records in 2017. Network security services ensure your cloud systems have the proper security in place to avoid data breaches. 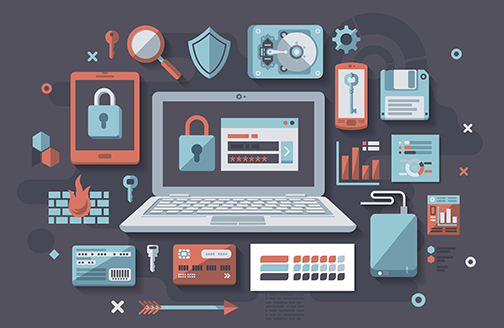 Third-party app security: Not all programs are created with your company’s safety in mind. Many third-party apps don’t come with sufficient or updatable security measures. Cybersecurity weeds out these unsafe applications and puts the security solutions in place that many apps lack. Subpar IT processes: Sometimes, small businesses don’t have the funds or knowledge to keep up with increasing threats or changing security best practices. Without the budget to hire a dedicated IT team, many companies unknowingly leave their infrastructure at risk. But outsourced or cloud-based cybersecurity solutions offer an inexpensive alternative that helps you avoid loss of income after a security breach. In-house: Many large organizations have their own security team in place to perform cybersecurity services. This do-it-yourself approach allows you to take control of your own security and privacy with staff that knows your business and its exact needs. 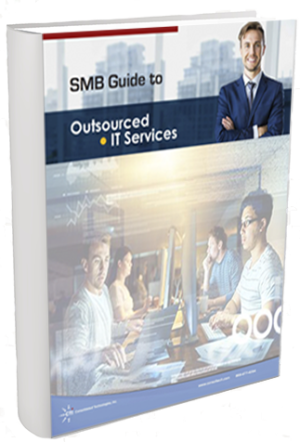 Outsourced: Outsourcing cybersecurity is an excellent way for businesses to spend less time performing tedious security measures and more time focusing on more productive tasks, while a third-party team oversees cybersecurity. IT security as a solution: In the age of software as a service (SaaS), more products and services than ever are now available via the cloud — including cybersecurity. Cybersecurity SaaS is an outsourced approach in which you pay for cybersecurity solutions on a subscription basis. This allows you to keep up with the latest technology at a highly affordable price. Contact Consolidated Technologies, Inc. for a Network Security Audit Today! If you’re ready to learn more about the vast benefits of cybersecurity as a solution, contact our team for a free network assessment today! With over 20 years of experience helping thousands of businesses like yours withstand cyber threats and protect valuable data, we’re confident in our ability to help you improve your network security. Don’t wait until it’s too late — request your free consultation today! For a Free Network/ Security Assessment, please fill out the form below and we will contact you with further details.